The Internet of Things (IoT) and a higher degree of (partially) autonomous communication between devices require an integrated connectivity . In this article, we use building automation – a domain with high innovation speed - to demonstrate how to meet that challenge: by defining a common abstraction layer across communication technologies, standards, vendors and applications. We focus on reusing existing approaches and solutions. This article introduces a formal model definition as an interface to a building automation system. 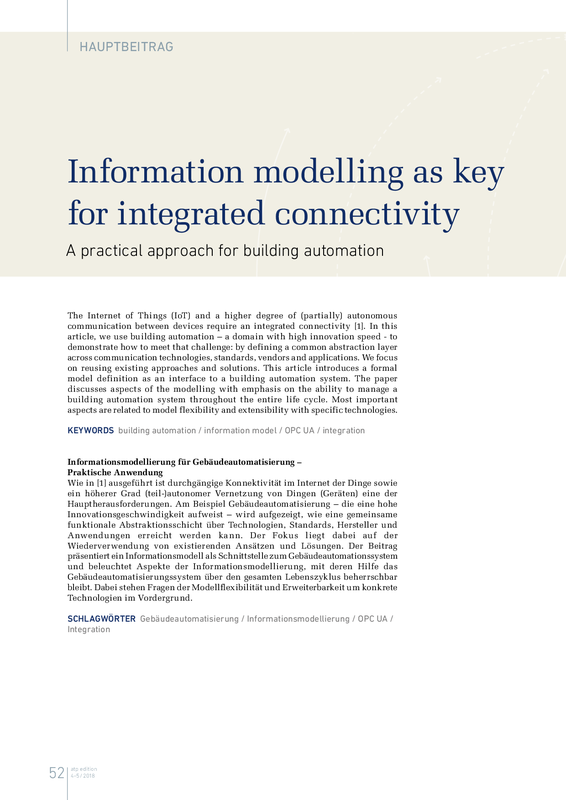 The paper discusses aspects of the modelling with emphasis on the ability to manage a building automation system throughout the entire life cycle. Most important aspects are related to model flexibility and extensibility with specific technologies.